Is the old Harvard Square train station now used as the bus dopot? It looks like it's some sort of old station. Please don't delete because this is bus-related. The old station apparently still exists (albeit, much was destroyed and turned into the present day main lobby). I believe I saw pictures which some urban explorers took inside, I wish I bookmarked them. I'd also have some questions for some of the folks on here because I found it strange that you would be able to see both track beds from one platform in the aforementioned images. Am I correct in saying both tracks were "isolated" (on different levels/walls off)? Perhaps it wasn't really Harvard at all. Harvard saw all kinds of phases during the construction of the Red Line extension and to its current configuration. There was the old Harvard, then Harvard Holyoke, Harvard Eliot, and Harvard Brattle (I don't know which was when, etc). On the southbound side, after the train turns left you can see a station platform on either side. One to the right, and one with awkward dimensions (as the remains are incomplete) to the left. On the north bound side just prior to the right curve into the station, a station platform is visible to the right. I don't know which is which, you'd have to ask someone who was around then. 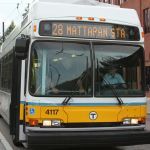 The current busway was formerly a streetcar subway, and MBTA Bus Operations people still call it the subway (or the tube). It was later used by buses and streetcars together, until the streetcars were discontinued at which time it became what you see now. The old ramp which ran from the old Harvard Station to the Eliot shops still exists, and is behind the platform wall of the upper busway on the Bennet Alley end. Others can be far more specific than I. Our site Admin has a great site in which he has posted the photos he took of the old station. Since there were many "old" Harvard stations I am not sure if this was the one you were thinking of. Here is Johns amazing photo set, I'm sure he wont mind the free plug. I believe the question was "Is the current busway a former train station." To which the answer is no. Although like I said it was originally used by streetcars, making it similar to a green line stop today, except with buses mixed in (must have been neat). Adams_Umass_Boston wrote: Our site Admin has a great site in which he has posted the photos he took of the old station. Since there were many "old" Harvard stations I am not sure if this was the one you were thinking of. The images on Page 3 appear to be from the same location I saw images of, that must be it. Thanks! CRail wrote: I believe the question was "Is the current busway a former train station." To which the answer is no. Although like I said it was originally used by streetcars, making it similar to a green line stop today, except with buses mixed in (must have been neat). Enclosed multi-mode terminals were actually pretty common. Forest Hills, Egleston, Dudley, Sullivan Sq., Everett, Ashmont, Fields Corner, Andrew Sq., Harvard Sq. had them, running rapid, surface, trackless, and buses - and yes, they were way cool ! Actually, it was strictly a streetcar subway in the early days with regular ballasted trackbed and all. It went over to dual use sometime between 1938 when the 72 became the first line to go trackless and 1958 when streetcar service on the 71, 73, and present-day 77A ended. I don't know exactly how long it was multi-use...probably started when the number of bustitutions hit critical mass and they needed someplace other than Cambridge Common and Mt. Auburn to turn routes. Id also wager that the question is about the two bus tunnels. Someone above me mentioned a third ramp....so the trolleys/buses had another way to access the tunnels? Right now, the problem the bus routes have is that to go from one tunnel to the other one, the driver has to exit onto the street. It started "dual-mode" in 1938 with the Huron Avenue trackless line (72), followed by the 71, 73, 77, and 82. Buses got in there in the early 60's. Last edited by 3rdrail on Wed Mar 23, 2011 11:22 pm, edited 1 time in total. Yeah, but did the 72's start using the tunnel immediately in '38 or were they looped around Cambridge Common until some of the lines coming other directions into Harvard went by the boards? I doubt they would've dropped everything to pave and re-rail the tunnel right away for a short lower-ridership line of connecting wire. It would've taken a few more years and increasing system isolation from connected track (e.g. the Lechmere lines going in '41 and severing whatever extant track connection was left on Somerville Ave. to the carhouse) for the writing on the wall to give impetus for future-proofing the tunnel. Harvard didn't suffer its first really crushing streetcar blow until the 1 fell in '49, ending all streetcar service to the south. F-line to Dudley via Park wrote: Yeah, but did the 72's start using the tunnel immediately in '38 or were they looped around Cambridge Common until some of the lines coming other directions into Harvard went by the boards? I doubt they would've dropped everything to pave and re-rail the tunnel right away for a short lower-ridership line of connecting wire. It would've taken a few more years and increasing system isolation from connected track (e.g. the Lechmere lines going in '41 and severing whatever extant track connection was left on Somerville Ave. to the carhouse) for the writing on the wall to give impetus for future-proofing the tunnel. Harvard didn't suffer its first really crushing streetcar blow until the 1 fell in '49, ending all streetcar service to the south. The 1938 map specifies that route (then the 51) as stopping at "Harvard Sta. ", same as the routes that were still streetcars at the time. Other routes, like today's 69 (then the 66, and also a TT line), are listed as "Harvard Sq." So it would appear that the tunnel floor was paved at the same time the 72 went TT. Looking at the maps brings up another question: did the current 69 go through the tunnel before it went TT, or has it always looped around on the surface? Trackless trolleys had been used on the 77 Harvard Sq to Lechmere route for two years prior to the 72's debut in 1938, the TT 77's knocking their steel-wheeled cousins off the track. (I'm not entirely sure if the 77 streetcars used the tunnel but I think that they did.) The 77 trackless trolleys didn't use the tunnel at that time. BERy had been making plans for a Cambridge Trackless network since 1930 and wanted to use the streetcar tunnel for most of the trackless routes. BERy and the MTA both always considered trackless trolleys as surface cars and not part of their bus fleet (and justifiably so as they are legally street railway vehicles and not motor vehicles- you don't have to be licensed nor do they need to be registered to be legally operated on public ways). As you stated, F, BERy did extensive re-fitting of the Harvard Tunnel for Trackless use prior to the 72's maiden voyage, which paved the way for the other trackless routes. So, in a nutshell, to answer your question, no- they didn't do it just for the 72. The 72 was the prototype for tracklesses in the tunnel, probably picking it for it's "short lower-ridership line of connecting wire". Also, push my bus service 1964 start date ahead at least a year as I found an early 1963 photo of a GMC in one of the tunnels.